Howard Clarke, Boarder, M, Wh, 14, sng, MS/MS/MS, Laborer, General Farm. Eva Percy, Sister-in-law, F, Wh, 13, S, MS/MS/MS. Lue Percy, Mother-in-law, F, Wh, 56, wid, MS/MS/MS. Ada I. Culpepper, Granddaughter, 15, MO/MO/MO. Irene Culpepper, Granddaughter, 5 3/12, MO/TN/MO. E-mail written April 2002 to e-mail address from Barry K. Hedden. George W. Culpepper, Father, M, Wh, 75, wid, SC/SC/SC. J B Culpeper (2-p), White, born 1880, died 5 May 1934 in Robeson Co., NC. George Winston Culpepper and Martha Louise Stokes (Stoker?) are the parents of two unnamed Culpepper daughters born 15 Jul 1934 and 16 May 1936, both in Robeson Co., NC. George Winston Culpepper, Male, White, Married, born 15 Sep 1915 in SC, died 5 Jan 1981 in Chapel Hill, Orange Co., NC, SSN: 241-05-7739, resided in Laurinburg, Scotland Co., NC. ED 25, Sheet 6A, Line 26, Maxton, Robeson Co., NC. Eula Culpepper, Wife, F, Wh, 40, md@16, SC/SC/SC, Not emp. Marguerite Culpepper, Dau, F, Wh, 3, sng, NC/SC/SC. E-mail written 18 Apr 1942 to Warren Culpepper from Susan Singer (former neighbor), e-mail address. George W Culpepper and Louise Stokes are the parents of George Winston Culpepper, Jr., Male, born __ 1950 in Scotland Co., NC. Carrie Culpepper, Dau, F, Wh, Apr 1900, 1/12, sng, NC/NC/NC. John Holland, Son, M, Wh, 8, sng, NC/NC/NC, Laborer/Wagon Factory. Rosa P. Culpepper, Daughter, F, Wh, 25, sng, NC/NC/NC, Bookkeeper/Plumbing. Mary E. Culpepper, Wife, F, Wh, 60, md@23, NC/Sweden/NC. Mary E Culpepper, White, born 1869-1870, died 13 Feb 1945 in Wilson Co., NC. 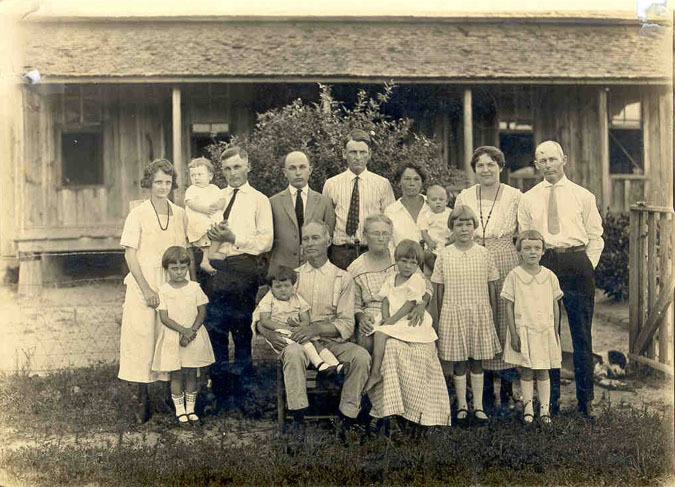 R A Culpepper and Mary E Ryburg are the parents of Rosa Agnes Culpepper, Female, born 12 Apr 1894 in New Hanover Co., NC. ED 23, Page 1A, Wilson, Wilson Co., North Carolina. Lonnie Culpepper, Son, M, 4, S, OK AL AL. The Daily Oklahoman, Oklahoma City, OK.
Obituary for Buddie L. Culpepper, 23 Jan 1996, page 25. Buddy Culpepper, Son, M, 14, S, OK AL AL. Buddy L Culpepper, White, Single, born 1915 in Oklahoma, residing in Seminole Co., Oklahoma, enlisted as a Private in the US Army on 17 Jan 1941 in Oklahoma City, Oklahoma. + Omie L Culpepper, 83634294, Jun. 22, 1886 - Sep. 16, 1987. Rubie Culpepper, Wife, F, 29, M1, md-3 yrs, ch 0/0, TX MO LA. Rubie Culpepper, Wife, F, 39?, M, TX TX TX. Luther Culpepper, Son, M, Wh, 5, sng, TX/TX/AL.
? Culpepper, Daughter, F, 1/12, S, TX TX TX. Precinct 8, Dallas, Texas; Roll: 2322; Page: 3A; Enumeration District: 142. Gertrude Culpepper and A T Borchardt Sr. are the parents of Marguarite Borchardt, Female, born __ 1928, A T Borchardt Jr., Male, born __ 1930, and Fredrick Evan Borchardt, Male, born __ 1931, all in Dallas Co., Texas. E-mail written 2001 to Lew Griffin from Betty Cabbiness (niece of Cody Culpepper #5911), e-mail address. Florine Culpepper, Dau, F, 4, S, TX TX TX. Florine Culpepper, Dau, F, 14, S, TX TX TX. Maud F. Culpepper, 17 Jul 1891 – 9 Jan 1974. Cody B Culpepper, Male, Single, died 18 Feb 1973 in Gregg Co., TX. Maud F Culpepper, Female, Widowed, died 9 Jan 1974 in Gregg Co., TX. Florine Culpepper and Forrest Gilbert Prutzman are the parents of Pamela Ann Prutzman, Female, born __ 1952 in Tarrant Co., Texas. Florine Culpepper and Forrest Gilbert Prutzman are the parents of Katy Jo Prutzman, Female, born __ 1957 in Dallas Co., Texas. E-mail written 2000 to Lew Griffin from George Ross Culpepper, McAllen, TX. Rebecca Sorrels, Sister-in-law, F, 49, S, TX TN AR. Carl C. Culpepper, Son, M, 18, S, TX/GA/TX. Carl C Culpepper, White, born 1913 in Texas; Resides in Caldwell Co., TX; Enlisted 25 Apr 1944 at Fort Sam Houston, TX in the (Unk Branch) as a Private; Education: 4 years of high school; Occupation: Tractor or Truck Driver, Married; Height: unk, Weight: unk. E. L. Culpepper died 20 Apr 1951 in Travis Co., TX. Fannie Frances Culpepper, died 6 Dec 1951 in Bastrop Co., TX. Carl Curtis Culpepper, Male, died 23 Oct 1990 in Hidalgo Co., TX. Aletha Culpeppe (no dates) Infant of Carl. Elmer J. Culpepper, Head, M, 34, M, TX TX GA, Clerk-Produce Co.
J. R. Culpepper, Son, M, 1 4/12, S, TX TX TX. Geneva (Culpepper) Fisher, Dau, F, 17, M, md@15, TX TN TX. Elmer Culpepper is the father of an infant born 14 Aug 1912 in Childress Co., Texas.